And now for something completely different. Life is not just about making jolly movies. Sometimes it's also about making money and trying to establish some kind of career. I have no illusions as to being able to make a living out of my animation or puppet building, but I have the intention of making it as an illustrator. I have started out quite modestly, but at least I'm on my way. I first published a couple of books in Sweden, but I really want to branch out in the US, where the big money and the big opportunities are. I self-published Fearsome Critters at Lulu, a book about the sometimes outrageous creatures of lumberjack folklore. Then I got in touch with Kelly Christiansen at Cyberwizard Productions. 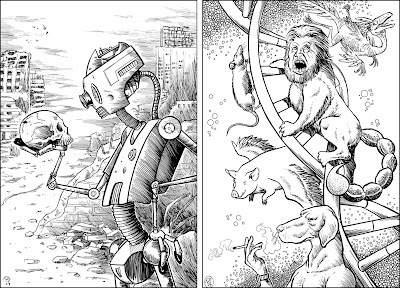 She took a fancy to my art and comissioned some illustrations for the humorous fantasy/sci-fi anthology Strange Worlds of Lunacy. After that I did art for L. Frank Baum's American Fairytales (not yet published). 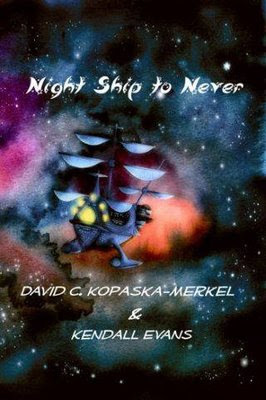 Just published, however, is Night Ship to Never, another anthology, collecting the sci-fi poems of David Kopaska-Merkel and Kendall Evans (some examples of the illos shown below). All of that was in 2008. During 2009 I'll finish several book projects that I want Kelly to publish for me, and so far she seems to like what she's seeing. Cyberwizard Productions is a small company, but with big ambitions. Ideally I'd like to be picked up by a big publisher who can pay me big money, but since that hasn't happened yet I'll make do with what I can. Special make-up effects artist Tom Savini's motto is "The more you do, the more you get to do". I stand by that too -it is, in fact my experience that it is so. That's how the universe works. You have to show that you really enjoy your creativity and that you're going to keep going no matter what! 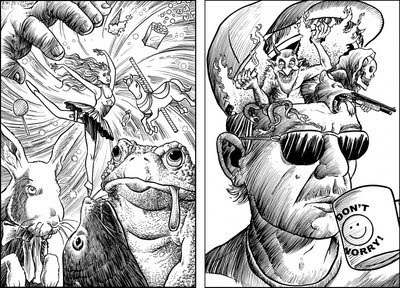 Comic book creator supreme Alan Moore pointed out that the projects you do out of excitement, just for the fun of being creative without any thoughts of success or recognicion, are the purest acts you will ever perform in your life and those are the ones most likely to succeed. I try to make every work a work of love, weather it's commissioned or my own brainchild. With that attitude I know the result of my efforts will always be the best I can make it. All of the live-action footage for Goblin Wood was shot in one afternoon. It was a quite sunny day and the image quality turned out OK. But not very fantasy-like. So since then I've been trying to improve the footage according to my tastes. I wanted a softened, almost hazy look to most of the shots. This meant the applying of filters in After Effects and also the adding of stuff that wasn't there when the film was shot, like large fungi, animals and fog. The story starts out in elf-land, where everything is bright and green. There are mostly trees with leafy foliage. We brought some smoke effects to the woods, but it was impossible to get the damn things working properly. I wanted some hazy sunlight "drapes" billowing in the background, but since the smoke effects wasn't cooperating I added the sunlight afterwards in After Effects instead. I also brightened the image and made it softer. Our elfin heroine enters the goblin wood. 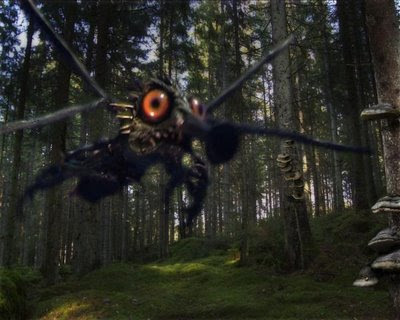 There was no dark spruce forest near where I shot the "elf-land" footage, so that had to be added later as well. The goblin wood-part of the shot is simply a combination of photos that were combined and spliced into a part of the image Anjelica (the elf) didn't enter. In the middle of the shot you can glimpse a winged shadow lifting from the ground. This is a flying bird of prey from Eadweard Muybridge's collection Animals in Motion. I just scanned the photos, coloured them and made a flying cycle that was then imported in the software StopMotionPro and animated. When the elf enters the goblin wood the mood and the look of the film changes. Everything gets darker and murkier. I added some fog shot against a black screen, downloaded from Detonationfilms.com and a nasty, mole-like animal peering up from his den beneath a rotting tree stump. After that was done I rendered the shot, imported it again and duplicated it in two layers. The top footage was blurred using Gaussian Blur and the blending mode "Multiply" was chosen. This made the image very dark, musty and atmospheric. A bit too much, actually, so the transparency of the top layer was amped up a bit. All of the goblin wood-shots were processed in this way. The mole-like animal that is briefly visible in the above shot is an old puppet I built for a disastrous film project called Virgin Tears. It actually started life as a musical version of Lord of the Rings! For real! At first we got permission from the publisher Harper Collins and the Tolkien estate to do an amateur version of the story. Then New Line Cinema pulled all the worldwide rights to protect their interests and the film mutated into something different and quite unwatcable. I produced some stop-motion for the project, including shots of the mole monster that was added to scenes previously depicting the encounter between Frodo and a barrow-wight. Another example of the original shot having the "goblin filter" added, along with some oversized fungi. More photos of fungi, toadstools in this case. A puppet of a walking toadstool was also included. More smoke effects from Detonationfilms.com. The eye appearing in the mossy rock was a glass eye in a cardboard socket, that I animated and keyed into the shot. The elf triumphantly puts her foot on the fallen monster she's just vanquished. We simply put a big stone on the ground where the creature would be placed, and the keyed-in pupped was aligned with Anjelicas foot. Easy-peasy! I had high hopes to finish the film Goblin Wood (see earlier posts), shot this past summer, before the end of 2007. I realize now that that was incredibly optimistic (as always), so let's say instead that it'll be finished during the spring of 2008. 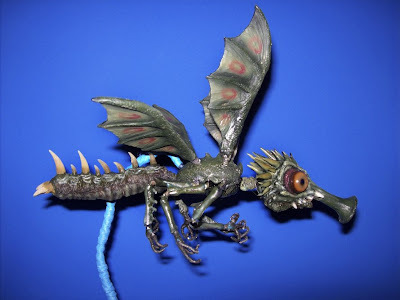 In this film the elfin heroine fights a firebreathing, flying dragon-insect-something -a "dragon fly", quite simply. 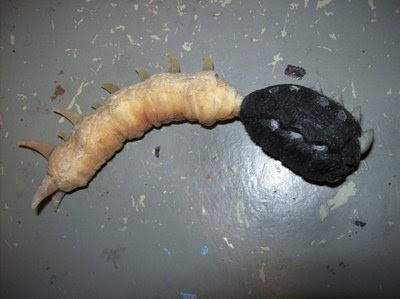 Previously I have built all my animation puppets using latex, sometimes reinforced with cotton to achieve a leathery, shell-like feel to certain parts of a puppet's anatomy. I've used this particular technique for insect-like or crustacean creatures. 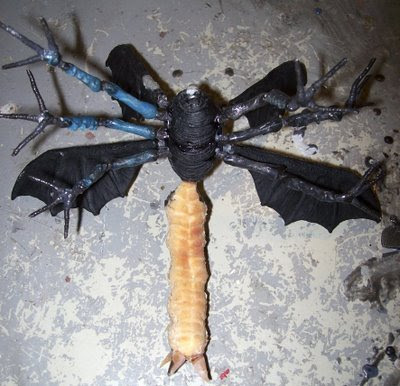 For the dragon fly I decided to cast the hard parts of its body in plastic and cover the joints with latex. 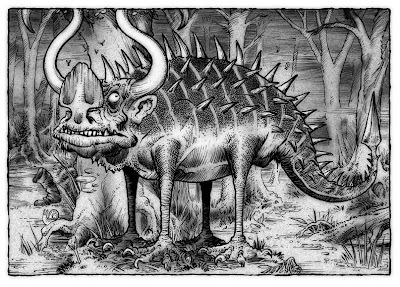 This monster was sort of inspired by the works of Swedish horror/fairy tale artist Hans Arnold. Check out his web page and you'll see what I mean. 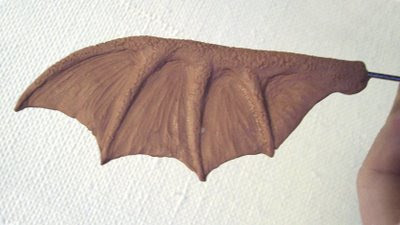 The head of the dragon fly was sculpted in Chavant and a mold in Dragon Skin Q silicone rubber was created for it. 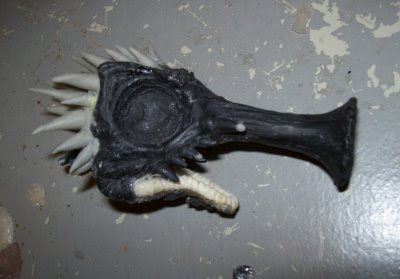 The head was cast in SmoothCast 325 plastic. Spikes were added to the back of the head using Apoxie sculpt and a flexible lower jaw was built up with wool string and latex over aluminum wire. 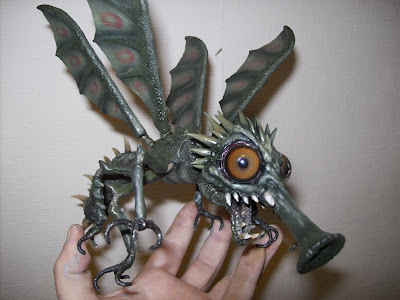 The body was done the same way as the head, with holes drilled out for attaching the legs and the wings. The tail was created by wrapping yarn around aluminum wire and adding cast patches of latex skin from existing skin molds over that. The horns were also cast in latex from different old "monster" plaster molds. Recycle if you can; it saves both time and money! 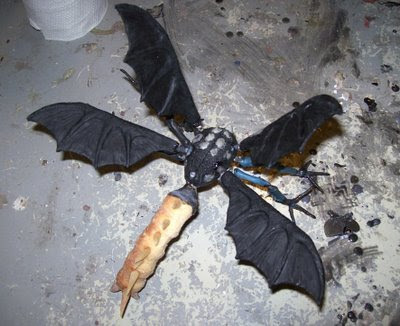 The wings were a bit of a bother to make. I had to sculpt them as thin as I possibly could and create a silicone mold for them. I say "them" but of course I mean "it". 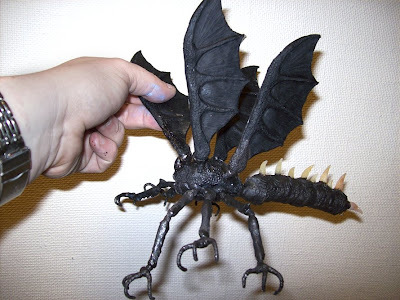 I only sculpted one wing and cast four duplicates in plastic. The legs were easier to do (I think I did all six in about twenty minutes) and created the way I do all puppet armatures -braiding aluminum wire attaching one end to a power drill and holding the other with pliers. The stiff parts of each leg was built up with Friendly Plastic. Normally this construction would then be covered by foam rubber, latex and paint. Here are the finished legs and wings attached to the body. I really should do something about the floor in my workshop! A view of the belly. A black base coat has been added to the puppet. But how come it's got no head? Because in the film the monster blows its own head off at the end. I attached a short screw to the end of the puppet's neck, so I could screw its head on and off the body (the creature being headless after the explosion). 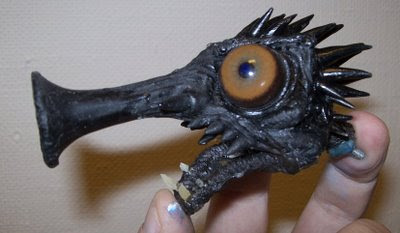 The eyes are bought from a taxidermist's supply house. 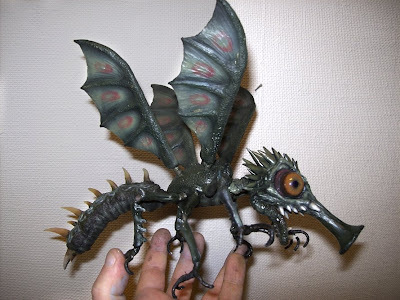 The finished puppet was painted with acrylic airbrush paints. The joints for the wings and the legs were covered with sewing string and tinted latex. For animation the puppet was mounted on a flexible support rod. 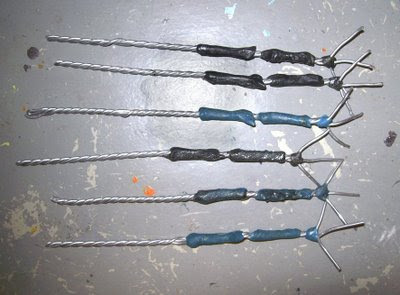 It was simply two thick pieces of aluminum wire braided together and stuck to a block of wood. The wire was covered with thick, soft string painted blue. Thus the support rod could be keyed out with the background. 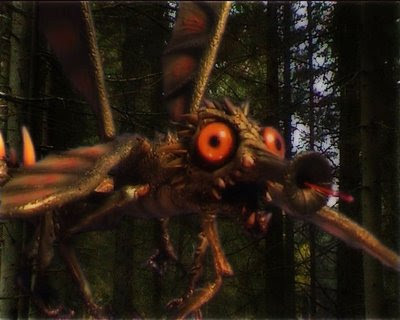 Two stills from the film showing the fire fly on the prowl in the woods where I shot most of this project. Atmospheric filters and motion blur have also been added. In the last photo the heroine has shot a pine cone-tipped arrow into the snout of the monster, which acts practically like a flame thrower, and jamming it. So I guess you can figure out what happens next. KA-BOOM!